Facebook is the new big way to promote your business or website. But with three different ways of doing so, how can you be sure what's right for you? Most people are aware that Facebook is one of the largest social networking sites and a great way to promote their business. The only problem is - actually figuring out how to set up the method to get new contacts for your business. Facebook has three main ways of interacting with people - pages, profiles and groups. So which one is the right one to get you the most customer attention? Profiles were the original means of interaction on the site. Originally used as a way for people to interact and share their updates with selected friends while still maintaining privacy, they're slowly being adopted by businesses and other organisations as well. You can decide who views all your information and updates. You can directly message any friend of the profile, without needing them to message you first. People can easily suggest you to their friends. You need to completely log out of Facebook and log back in with a different email address to change to a different profile. Groups and pages allow you to be a member or admin on as many as you wish. Profiles - For interacting with real people, with real names. Pages - For promoting a brand or business. Groups - For a small group of people who want to regularly interact on a mutual interest. People looking for businesses are less likely to search under profiles than under pages. People who are "friends" with your page leave their own profiles wide open and you can look at them, which some people would consider a privacy issue. Pages were the original format that Facebook created to promote a business or website. Own as many pages as you wish on one Facebook profile. Easily advertise your page in the side bar. Retain anonymity for your personal profile while still having the option to talk to any user privately via the page inbox. Display a link to your personal profile if you wish. Easily hide messages so only you and the message creator can see it. Block and ban page likers if needed. Add "apps" to your page including website links, competitions, eShops and more. Any person with a Facebook profile can like your page. 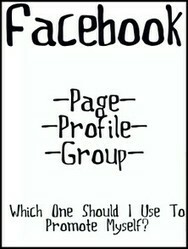 Any Facebook user can create a group. Generally a group is designed to allow interaction with other people of mutual interest, without effecting any other part of your Facebook life - the group discussions are contained within the group, with no preferential posts among members or admins and a simple system of "bumping" posts when a new comment is added. Groups can be set to open, closed or secret, depending on who you wish to have join. A great means of keeping interesting topics at the top of the group by simply posting. Admin must post as their profile name, they do not have the anonymity of posting as the group name. Updates are not displayed in user news feed. Facebook members are less likely to join a group unless they're quite interested in the topic, as it means they need to revisit the group for updates, instead of see them in the news feed. Facebook pages were set up with the idea of allowing businesses to easily promote and share their information and updates. Profiles and groups were not. Unless you want to strictly limit clientèle to those you can vet before adding to your membership, it's a good idea to set up a business page. If you do want to limit your business associations, set up a profile. Groups are best kept for interactive discussion, not business promotions. Thank you for this article. I'm glad I found this (I was looking for Pinterest info when I came across this article). I'm really clueless when it comes to Facebook (so clueless it's a wonder I actually have an account there; it's been forever since I last logged in though). Anyway, I want to try Facebook again since I heard it was actually fun and it can help with promoting articles, etc. I heard about the Facebook profile, page and group and that really confused me 'cause I had no idea which one I should choose or what the differences between the 3 were. Thanks for including a recommendation. I guess I'll go with a Facebook page too. But, just to clarify - we need a Facebook profile before we can have / create a Facebook page? Also, how many Facebook accounts are we allowed to have? I was thinking of making a new one and using my pen name / pseudonym (Freya Yuki). Is that okay? This is very helpful. I'm starting to understand the uses of facebook a bit better now.